The movie Believe Me: trailer, clips, photos, soundtrack, news and much more! Just pray these guys get caught! I do dig this latest cut of the trailer of Believe Me. Now I feel like watching the film! What about you? The cast inlcudes Alex Russell, Zachary Knighton, Johanna Braddy, Miles Fisher, Sinqua Walls, Max Adler, Nick Offerman, and Christopher McDonald. The film will open in theater son September 26, 2014. The cast includes Alex Russell (who played the role of Matt in the 2012 movie “Chronicle“), Zachary Knighton, Johanna Braddy, Miles Fisher, Sinqua Walls, Max Adler, with Nick Offerman, and Christopher McDonald. It’s only a sin if you get caught. 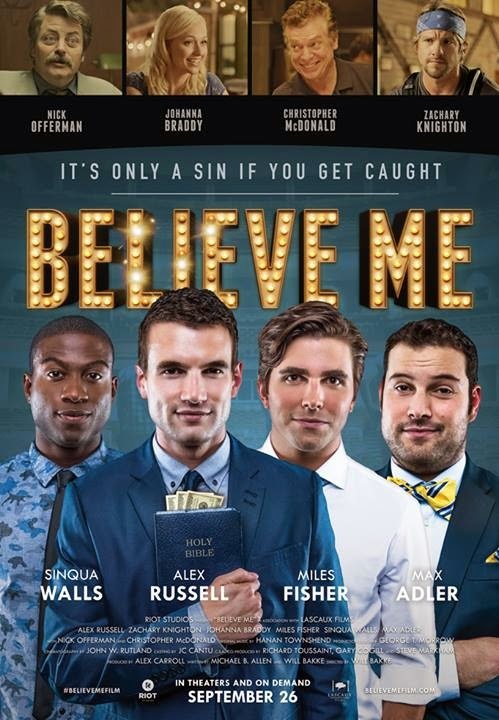 The tagline of this poster refers to embezzlement… but I guess it could also apply to adultery, nope? LoL! The release date of Believe Me is set to September 26, 2014.